Displacement reaction. Magnesium coil was added to a test tube containing a 0.2M copper (II) sulfate solution. 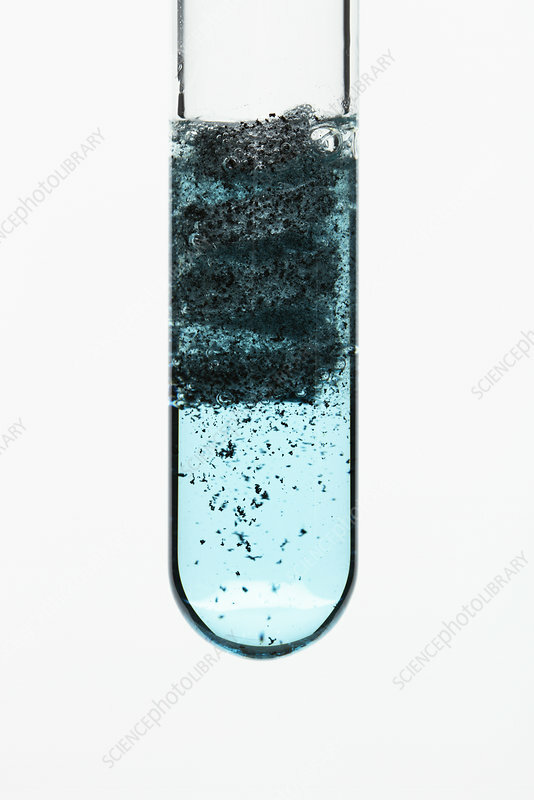 Since magnesium is more reactive than copper, a single displacement reaction occurred. Copper metal and magnesium sulfate formed as a result: Mg + CuSO4 -> Cu + MgSO4. In this sequence photo 1 was taken seconds after the coil was added, photo 2 was taken after about 1 min, photo 3 was taken after about 6.5 min, photo 4 was taken after about 1 hour. Note hydrogen gas bubbles that were produced in a secondary reaction. Photo 1 of 4.